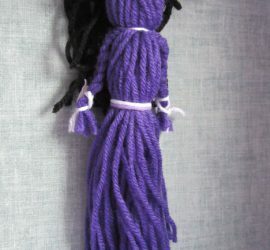 Our Yarn Dolls are great quality, and are fun to play with! We offer a very large variety of colours, and two sizes: Small, and large. 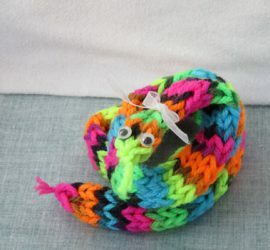 Our Yarn Snakes are made with high-quality yarn. They are about 1 1/2 feet long, and can be used for so many things! Our Mini Pillows are so cute, and can be used for things such as: Pincushions, Pillows for dolls, and Decoration! Our Stuffed Bunny Rabbits are wonderful toys for kids! They are great quality, and handmade! Our Yarn Octopuses are great toys for kids! They come in two colours in our Shop: dark red, and blue. Our bookmarks are very handy, they are laminated, and also great quality! 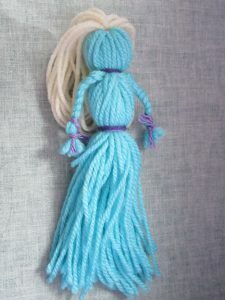 Our Yarn Dolls are great quality, and are fun to play with! We offer a very large variety of colours, and two sizes. Every yarn doll is Handmade. 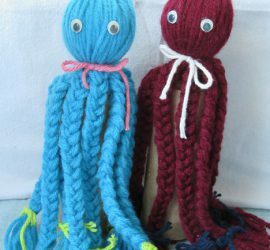 Our Yarn Octopuses are great toys for kids! They are made of good quality yarn, hot glue ( to stick on the eyes), googly eyes, and a Styrofoam ball. 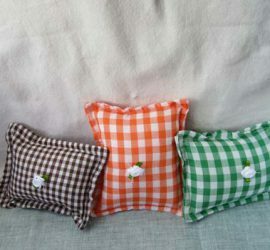 Our Mini Pillows have many uses, such as: pincushions, doll pillows, or decoration. They come in 3 colours in our Shop. We offer a variety of options for you to make your doll unique! These include your choice of: Hair colour, outfit colour, and eye colour. 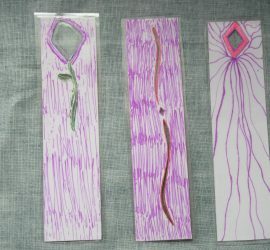 We offer a large variety of hand made bookmarks. All of our bookmarks are laminated, so that they will last a long time. Enjoy your bookmark! Welcome to AMEE’s Craft Company, your home-made craft supplier! We offer a variety of home-made crafts, from Yarn Dolls, to Bookmarks. We guarantee that ALL of our products are hand made. We hope that you find what you are looking for.